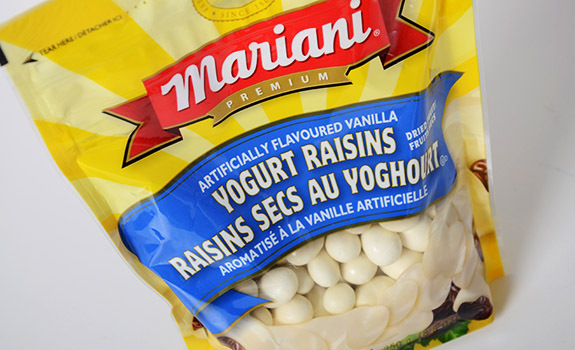 A bag of Mariani Vanilla Flavoured Yogurt Raisins. I’ve been nearly tempted into buying these for over a year, as I keep seeing them near the grocery store produce section when I’m hunting for Craisins or dried blueberries. I finally buckled and bought a bag. I’m usually a fan of coated raisins – chocolate, yogurt and, yes, even carob – so I’ve got some experience with the genre. The Look: Bright packaging, with lots of yellow, red and blue to catch the eye. There’s a little see-through window on the front of the bag that allows you to see the yogurt-coated raisins inside. The coating is more matte white than shiny, and the shapes and sizes vary depending on the raisin inside. If you’ve ever had yogurt-coated raisins, they look like that. The Taste: A bit waxy and dull at first, though the flavour and sweetness builds a bit as the coating melts in your mouth. The vanilla flavour is artificial, and they taste more oily than creamy. There’s typically far more coating than raisin in each unit, so I’d rather think of them as yogurt-coating balls with raisin centres. It’s not a bad flavour, but a small number is enough at one sitting. I’ve had the bag open at my desk for a couple weeks, and I’ve managed much restraint in snacking on them. For me, this is a surprise. 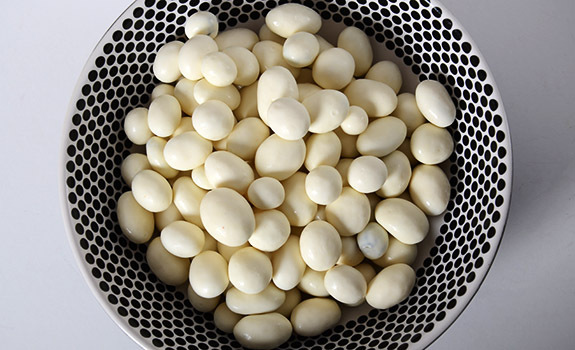 A bowl of Mariani Vanilla Flavoured Yogurt Raisins. They look like yogurt-coated raisins, don’t they? Cost: $4.99 for a 250 g (8.8 oz) bag at Calgary Co-op. Availability: Widespread. Look for them in or around the produce section at the supermarket. Nutrition? : Per 2 tbsp (30 grams): 150 calories, 7 grams of fat, 25 mg of sodium, 1 gram of fibre, 2 grams of protein. The verdict: Not bad. I’ve had better yogurt covered raisins for less cash, so I’ll probably opt for other brands over these in the future.